Qasala had a more dignified feel than Sakhmet, despite the slight crumbling of its stone walls and buildings. It was as if the people still felt the weight of the curse that had been thrust upon them so long ago. There were still busy, bustling crowds, but the inhabitants of the city still seemed a little wary. True to his word, Souvier strode up to the first book stall that he encountered, dragging Tazaa along behind him. She stared at the scrolls and old tomes with a dazed look. "You choose something," he told her, as he picked up a book as thick as his fist and leafed through the pages. The information was much too dry, so he put it back. "I don't know what anything is," she argued. "Can't read, remember?" The shopkeeper look a little appalled at that, and Souvier fixed him with a steady stare. The Elephante blinked back nervously and gave a weak smile. "If I may suggest these," he said, pulling out a scroll and a book from behind the counter and placing them in front of them. Souvier picked up the book, because It would probably fare better during traveling, and skimmed the first few pages. "This looks good," he said. "It's some desert tales. Tazaa, have you picked something yet?" She sheepishly handed him a slim volume which contained a picture at least every three pages. But the writing looked neat enough so he bought them both, and her grin was so wide that he couldn't help grinning back in return. "So where's this contact of yours?" he asked her after he had safely stashed the books away. "Oh, well I have a friend who works at a food stall along here. He usually sends me the messages." She trotted away, and Souvier hurried after her, until she stopped at a tiny food stand with a brown Draik behind the counter. "Ahh, Miss Itja," the Draik said, handing her a flatbread with meat and veggies on top. "It's been too long since I last saw you." "How's business, Khaled?" she asked, happily munching on her food. "I heard there's someone who wants my help?" "Business is as usual, Miss Itja," he said. "And who is your handsome friend here?" Souvier found himself on the receiving end of another flatbread, and gingerly began eating it. He wasn't particularly fond of the native desert food. It just seemed like sand was a key ingredient to every dish he had ever tried in the desert. Thankfully, the flatbread was only a little grainy. "This is Souvier. 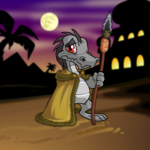 He's from Neopia Central and he's coming along with me to help... translate." "Ahh..." Khaled said. "I see. And how are you enjoying your visit, Mister Souvier?" "It's wonderful,' he said with earnest. "And this is delicious, by the way." The Draik beamed. Then he turned to Tazaa again. "A few days ago a Shoyru came flying into Qasala asking about you. He had this scroll." He passed her a carefully tied scroll with an official-looking seal stamped on it. The Gelert immediately passed it to Souvier, and both pets looked at him expectantly. It took him a moment to realise that Khaled couldn't read either, so he broke the seal and held the scroll open. "We ask that the Gelert named Tazaa Itja come to the Kingdom of Oesh, south of Qasala," he read out. "King Saladin the Third of Oesh seeks her help to recover a missing artefact that ensures the safety of the Kingdom and all its citizens. We ask that she comes with swift paws and a brave heart, and the rewards will be great. Well, this just sounds like a load of rubbish," he added. "Did they really write that?" Tazaa asked, peering over his shoulder at the scrawl that was incomprehensible to her. "It sounds a little odd." "No, I added that last bit," Souvier told her. "I was just saying that it sounds like a load of formal rubbish. Are you sure it's real?" "There is indeed a Kingdom called Oesh to the south," Khaled said. "I know of some traders who have been there. It's quite small, smaller than Qasala, and used to be a part of the Qasalan Empire centuries ago. The Shoyru who delivered the message seemed quite frantic, and said he must return as fast as possible to protect the city." "From what, I wonder...?" Tazaa mused to herself. "Does it say anything else, Souvier?" He rolled out the scroll further. "Oh, there's a map here," he said. It was roughly drawn and looked like it had been traced out in a hurry. There were the two dots of Sakhmet and Qasala, and the river in between had been traced down to the edge of the map. Far south, about twice the distance between the two great cities, a smaller dot was labelled on the banks of the river. "Well, there's Oesh." He pointed it out. "It looks quite far away. And what does this mean?" He pressed a claw to the area between Qasala and Oesh, where there were thin black lines drawn on. "Oh, those must be the Spires. They're these huge thin rocks that jut up to the sky." Tazaa looked excited. "I've never seen them before. I can't wait." She pulled the scroll out of his grip and studied the map, twisting it this way and that with her tongue poking out. "We'll probably have to stop for two nights, even if we leave now," she mused. "We had better get some more supplies." "You may, of course, take anything you want from here," Khaled offered, gesturing to his flatbreads, which seemed like the only thing on his stand that wouldn't spoil on the journey. "Oh, I can't do that without paying," Tazaa said, handing over a few coins accompanied by her grin. "Thanks for sending the message to me, Khaled. This looks like it could be fun." She then proceeded to drag Souvier around the marketplace for supplies, a journey which finally concluded at the Desert Arms shop. "What are we doing here?" he asked her, staring the racks of weapons lining the walls. The Lupe at the counter seemed far from impressed with either of them. "Well, there's been rumours of bandits around the Spires," Tazaa told him cheerfully. "And that area contains some rock formations that would make it easy for them to hide and ambush us." "Wonderful," Souvier said wryly. "Maybe I shouldn't accompany you after all." "But you have to!" Tazaa cried. "You read the message; it sounds quite urgent. So I'll end up going by myself anyway. And if I get attacked you'll have that on your conscience." The last was said in a very stern voice. Souvier sighed, wondering just what he had gotten himself into. "Well, I should warn you that I'm useless with any weapons." She laughed. "Doesn't matter. You just need to carry around something large and intimidating to scare them off. And if we do get attacked you can let me do the fighting." He must have given her an incredulous look, because over the next three seconds she produced four knifes from within her robes and held them out to him. He stared in disbelief and she tucked them away with a wink. "That's not even all of them," she assured him. "But anyway, buy this." She scooped up a spear that seemed far too ornamental to be of any practical use and wrapped his claws around it. "It looks fancy, and you can hold it up in front of you as a sort of shield if someone does take a swing at you with a sword." She gave him a little shove towards the counter, and the Lupe finally perked up enough to barter. Later, he walked out with her trotting beside him, holding the spear awkwardly in his right claw. "You need to hold it upright," she told him, tilting her head to the side as she surveyed him. "Pretend that you actually know how to use it.. .but don't hold it like that either, that looks like you're planning to stab someone." "Why didn't I just buy a sword?" he asked in resignation. "At least then I wouldn't have to carry it in my claws all the time." She chuckled as if he had told a joke. "Anyone who saw you holding a sword would know you've never used one. It would happen the moment you tried and failed to unsheathe it." "I think you should try and have a little more faith in my abilities," he muttered in reply, but she continued to act as though he wasn't complaining. They passed through the gates of Qasala in the mid-afternoon, and Tazaa steered their course slightly south-east, squinting fiercely at the compass as though it was trying to lead them astray. "So you can read numbers," Karf observed after a while, his voice muffled by the hood he was wearing wrapped around his head. "Not very well," she admitted. "But I can sort of guess." "Are you sure you don't want me to navigate?" he asked her, reaching out a claw. Her response was to growl and stow the compass away. He though he heard her mutter something about having found her way hundreds of times before and decided to leave it. That night after they had enjoyed a meal of flatbreads and the last of their fresh fruit, he cleared a space near the fire and used his spear to trace out the letters of her name. "This is a 'T'," he said, drawing two strong lines. She stared it in fascination, repeating the sound under her breath. He finished her name with a flourish and pointed out all the letters and their sounds. "How about your name?" she asked. He wrote that down as well, and then she spent the next half hour trying to replicate his letters. When he was satisfied he pulled out some paper and a pen and wrote it down, as well as the alphabet. "You practise writing this a few times tonight," he told her. "And then tomorrow when we walk make sure you have a look at it. We might try you reading a few words tomorrow night." He wrapped himself up in his blanket and fell asleep, but not before he saw her carefully tracing letters onto the paper. The next day they continued walking. Oesh didn't seem to be a popular kingdom to visit in the Lost Desert, because there was no road to speak of, having been covered up by the dunes long ago. They saw no other travellers and Souvier was beginning to get tired of the monotony of wave after wave of sand. In Neopia Central he had often gone for walks on the Endless Plains, but even that seemed more interesting than this, and the heat was stifling to boot. Then in the afternoon he saw, over the next dune, a tower of stone. "The Spires," Tazaa exclaimed, the first time she had spoken for over an hour. She had been too absorbed staring at the paper with the alphabet on it. They crested the dune and Souvier stared in wonder at the sight before him. At the bottom of the dune they were standing on the sand cleared away, leaving red-packed dirt underneath, spotted with half-brown tufts of long grass. And jutting up from the dirt were red, brown and black stones, some reaching only a few dozen metres into the sky, others several hundred. The taller ones were thicker around the bottom, perhaps twenty metres in diameter or more, and were pockmarked with tiny caves and cracks that a small petpet could have hidden in. They stood staring at the Spires for a long while, and Souvier tried to count as many as he could, but they stretched away on either side out of sight, nor could he see any end to them in front of him. Eventually Tazaa shook herself and bounded down the dune, spraying sand everywhere. "Let's go!" she cried happily. Souvier followed more slowly, and was relieved when the sand disappeared beneath his boots. Walking on sand had been a tiring experience, sinking several centimetres with each step and then expending more than the usual energy to pull his foot out and take another. Walking through the Spires was much more interesting than through the dunes, as well. Each Spire was different, some slightly crooked, others so smooth he wondered if they had been sanded down. Still, by the time the sun set he had grown tired of them. "Should we set a guard?" he asked Tazaa after his token attempt to start the fire on his own. This time he had managed to get the tinder to catch for a few seconds before accidentally blowing it out with his huff of surprise. She glanced away to her left, a habit that he had noticed her doing on more than one occasion, then shook her head, letting out an easy smile. "I'm a very light sleeper," she assured him. "If anyone approaches us in the night I'll wake you up." He shrugged, trusting to her judgement, but kept his spear very close to his side just in case. He pulled out the slim book from his bag and opened it to the first page, admiring the pictures inside. It must have taken a long time to finish this one book simply because they were so detailed. "So this is a story about a Djinn in a lamp," he told her. "Can you try and sound out this word here?" They never finished the first page before she finally gave up in exasperation. "I'll never be able to read," she sighed, slamming the book shut and turning away. "You will," he reassured her, and she turned back to smile at him. They sat for a while in companionable silence, then both wrapped themselves up and fell asleep. It was only a while later that she shook him awake. The fire had gone down to embers, casting a sinister red glow onto her face as she stared down at him. "Wake up," she whispered. "There are other pets here."